I take a lot of pride and joy in the cutting boards I make. In some ways, they are the quiet epitome of the Ruby Pear motto: beautiful, thoughtful, handmade. In addition to having a fantastic selection of cutting boards for sale in the Ruby Pear Store, I most love the opportunity to custom-make one specifically for you (or someone you love). Read on to find out how to design one for yourself! Boards range in size from small cheese boards (starting around 8″ x 10″) up to large chopping blocks (24″ x 16″ and 2″ thick … or bigger). For use as an every-day cutting board, aim for a board that is at least 12″ along one side. If you're like me, you'll appreciate the extra real estate of a 20" x 14" board. These boards have plenty of room for chopping, but can still easily be stored away when not in use. But if you've got the counter space, there's nothing like a 24" x 16" board to get all your mise en place in place. These chef's boards typically live in one spot on the counter, and are a beautiful (and functional) finishing touch to any designer kitchen. Most of my boards come with my signature double-bevel edge, which maximizes working surface, creating a fully reversible board while providing a comfortable ergonomic edge for handling. Cutting marks are much less noticeable, and the wood fibers aren't severed by the cutting action, so boards look better after user and last longer. It's possible to create more intricate patterns and designs with the blocks of wood. On the other hand, end-grain boards need to be thicker (for stability) and so are heavier. And the extra steps of cutting and arranging and polishing the pieces makes these boards about 50% more expensive than their long-grain counterparts. If you're looking for a lighter board, go with long-grain. 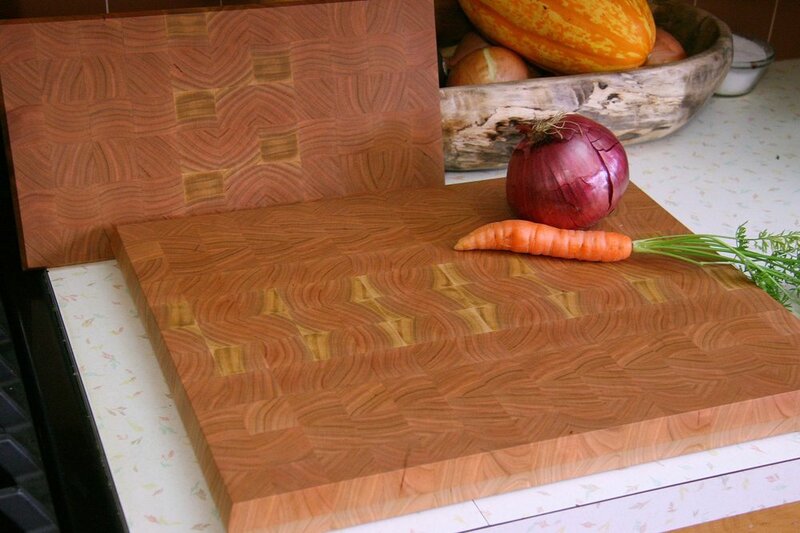 For end-grain cutting boards, the pattern on the face of the board is where the real art lives. I can create a uniform surface where the texture and grain in the wood really comes to life, or I can choose a board with natural variations to create zig-zags, diamonds, checkers, and stripes. I can even mix and match woods to create highlights. Most boards are made from domestic hardwoods: maple, cherry, oak, or walnut. My preference is to use just one species of wood in each board (with perhaps a small highlight from a different species). Occasionally I’ll mix in colorful hardwoods such as yellowheart, purpleheart, jatoba, or padouk, at my clients’ request. Boards are hand-selected at the lumber yard for grain, color, and balance of heartwood and sapwood. It takes a careful eye and experience to find the perfect board for each project. I also maintain a private collection of slabs here at the workshop, and some are suitable for cutting boards. My western maple bread blocks make a great centerpiece for a table --especially with a nice crusty sourdough on top! All boards are machine- and hand-sanded, then lovingly buffed with fine steel wool to bring out a natural gloss. The boards then get a bath of mineral oil to seal the grain, followed by a polish with our own BeeSpit beeswax paste (it smells great, and is great for your hands!). Everything that goes on the board is food-safe. This finish is easy to re-apply as needed -- just wipe it on, let it soak in a bit, and wipe it off. Read more about caring for your board, below. Your cutting board is beautifully polished and finished with a natural, food-safe mineral oil+beeswax finish. This finish mostly lives inside the wood, so you can chop and slice to your heart’s content. Both sides of the cutting board are useable. To keep your board flat, you should use both sides. To clean the board: wash with warm, soapy water and dry immediately. We find a chef's bench scraper is a great way to gather up the crumbs on a big board that we don't want to lug to the sink. You don’t need to worry about it too much, but in general don’t give it too much water exposure. Don’t leave it sitting in a puddle, or even on a damp towel. Prop it up so that air can flow evenly to both sides between uses. Uneven exposure to moisture — such as leaving it sitting on a damp towel, or trapping moisture under it — will cause the board to warp. You might wake up in the morning to find you’ve got a bowl instead of a board, but don’t worry! When the moisture evens out it’ll return to flat. Lean it so that air can flow to both sides and wait a day or two. You should refresh the finish occasionally — every week or few weeks or month, depending on use. My Beespit cutting board polish works great if you want to bring back the original shine. You can use some cooking oils, especially nut oils such as walnut, although avoid vegetable oils that will go rancid over time. The cheapest bet is to pick up a bottle of mineral oil from the drugstore: it’s cheap, odorless, colorless, and works just as well as anything else. It's especially useful as a primer before putting on Beespit polish (and that's what we do here in the shop). You can also lightly sand your cutting board to restore the fine polish on the surface, if you like. It’s solid wood and it’s yours — sand it all you want. Personally, I prefer the character that all the slicing and chopping gives it. Your cutting board is a tool, after all — a very beautiful, lovingly crafted tool. Enjoy it! Send me an email and we'll get the conversation started! Boards take about two weeks to build from start to finish, although rush jobs are possible. If you can't wait that long, you can always see what's available right now in the store. If you’d like to buy a board for yourself or a loved one, let me know!